This remarkable speaker system utilizes premium drivers, features a 'non-resonant' cabinet design for state-of-the-art sound quality and is glass mirror-finished to blend in with its surroundings. internal matrix for cabinet resonance breakup. Combination ceiling-suspended high quality speaker and plant hanger for Home Theater, surround-sound and music systems. 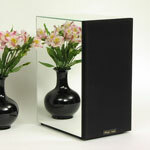 Wall-mounted solid redwood speaker capable of holding plants for Home Theater, surround-sound and background music. Designed specifically for the difficult placement and acoustic problems inherent in kitchens and bathrooms.